The Senate Committee on Works has recommended an increase in the pump price of petrol from N145 to N150 for the implementation of the proposed National Roads Fund (NRF). The increase was part of the recommendations made by the Senate Committee on Works, chaired by Senator Kabiru Gaya (APC, Kano) on the National Roads Fund (Est. Etc) Bill (SB.218). The report was scheduled for consideration during plenary yesterday, as it was on the order paper. It was however suspended for another legislative day due to time constraint. The committee recommended fuel levy of N5 chargeable per litre on any volume of petrol and diesel products imported into the country and locally refined Petroleum products. A copy of the report obtained by our correspondent revealed that 12 out of the 15 members of the committee have endorsed it. 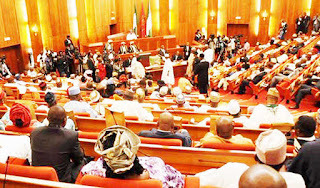 Senators who endorsed the report are, Senators Gaya, Clifford Ordia, Barnabas Gemade, Mao Ohuabunwa , Bukar Abba Ibrahim, Ben Bruce, Gilbert Nnaji, Abubakar Kyari, Ibrahim Danbaba, Mustapha Bukar, Sani Mustapha and Buruji Kashamu. 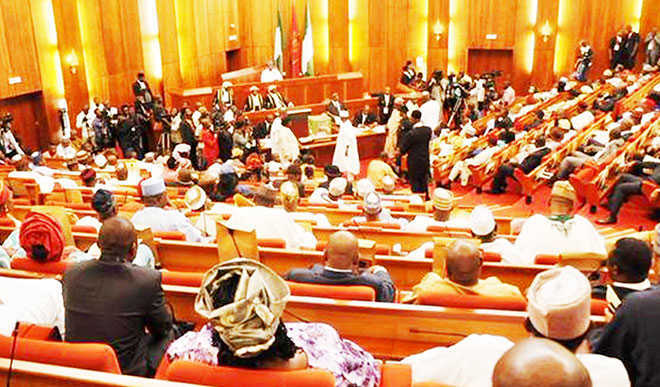 Those whose signatures were not appended on the report are, Senators Olusola Adeyeye, Biodun Olujimi and Ahmad Ogembe. The report has been distributed to senators. Under the sources of revenue for the National roads fund, the committee recommended as follows, “fuel levy of N5 chargeable per litre on any volume of petrol and diesel products imported into Nigeria and on locally refined petroleum products”. The committee also recommended toll fees; a percentage not exceeding 10 percent of any revenue paid as user charge per vehicle on any Federal road designated as toll road. It further recommended international vehicle transit charges, inter-state mass transit user charge of 0.5 percent deductible from the fare paid by passengers to commercial mass transit operators and axle load control charges. In the report, Gaya explained that the road fund was designed to address the poor funding of roads in the country. He said the fund when established would serve as a repository of revenues from road user related charges and other sources for financing, which shall be managed and administered for routine and periodic maintenance works on roads in the country. An aide of the Senate President on Print Media, Mr. Chuks Okocha said recommendation was still a proposal and that it has not been debated.